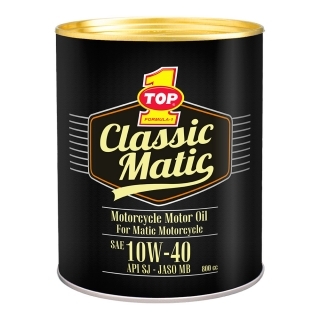 TOP 1 CLASSIC MATIC 10W-40 is a 4-stroke motorcycle lubricants for high-matic motorcycle created for the automatic motorcycle engine (scooter matic). Specially formulated using base oil group 2 with a purity level of 99.2%, thus preventing formation of sludge and crust, that keeps the cylinder and piston kept clean. Using the best additive containing moly additive to reduce friction at high temperature and high rpm or speed. Has a moderate viscosity appropriate in its class that provides efficient use of fuel. Lubricating film is stable despite the extremely hot conditions or very high rpm engine.